While dismantling the pallets the dices or little cubes are considered unnecessary but they can’t be really! 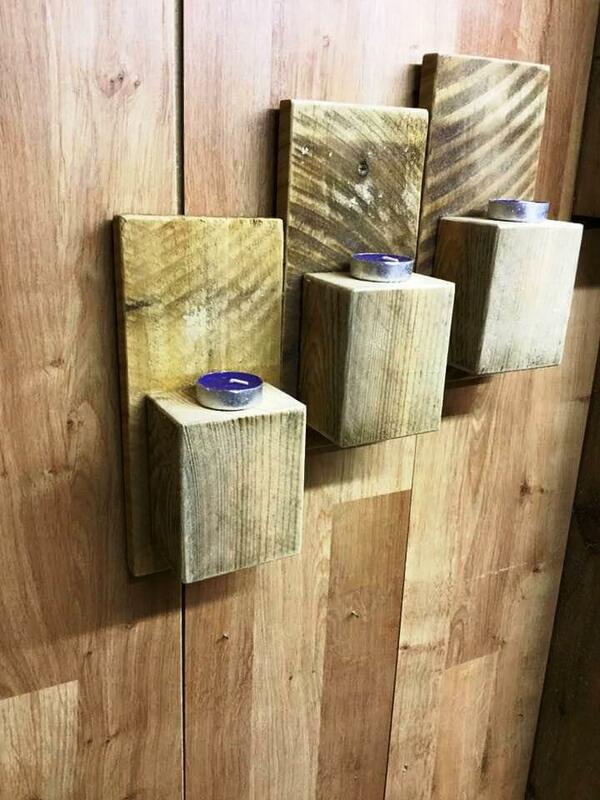 Just take a look at these fab DIY wall mounted pallet candle holders, a beautiful way to reuse the pallet remains and exclusively the separated apart pallet dices or chocks! Here some of pallet slats have been chopped to prepare the holding surfaces for the pallet dices or for a rustic wooden background as you can see! 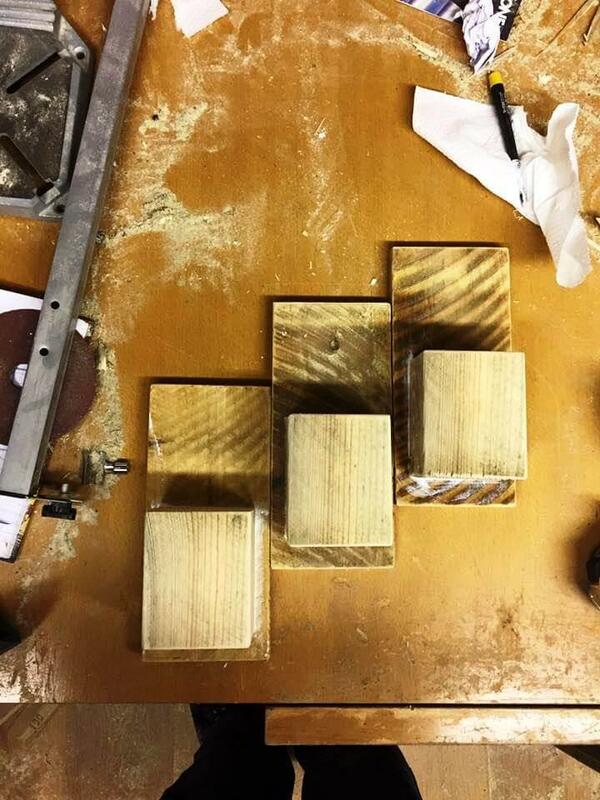 Here a stepped style has been preferred for a more glorious look of this wall hanging candle holders! 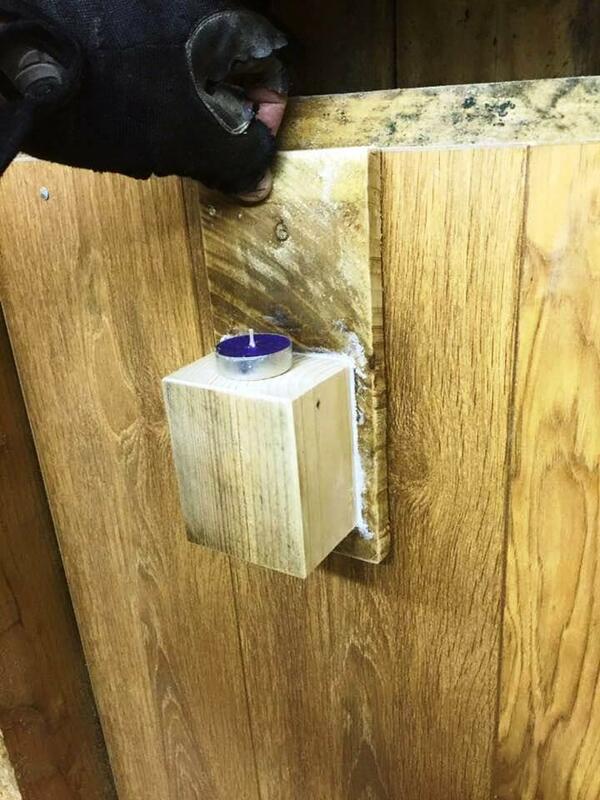 Palm the sharp wood cutting tools and make small cavities in the pallet chocks, just fill them with tea lights, wax or mini candles for beautiful lights out of them! For stepped art style wooden background, even a single pallet slat can be chopped for some mini wooden squares! 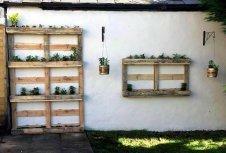 The entire project is to do with pallet leftovers! You can also paint the dices in so many different ways and can write some letters on them for beautiful shelf centerpieces or decors for your accent tables! They can also be used as tea lights! 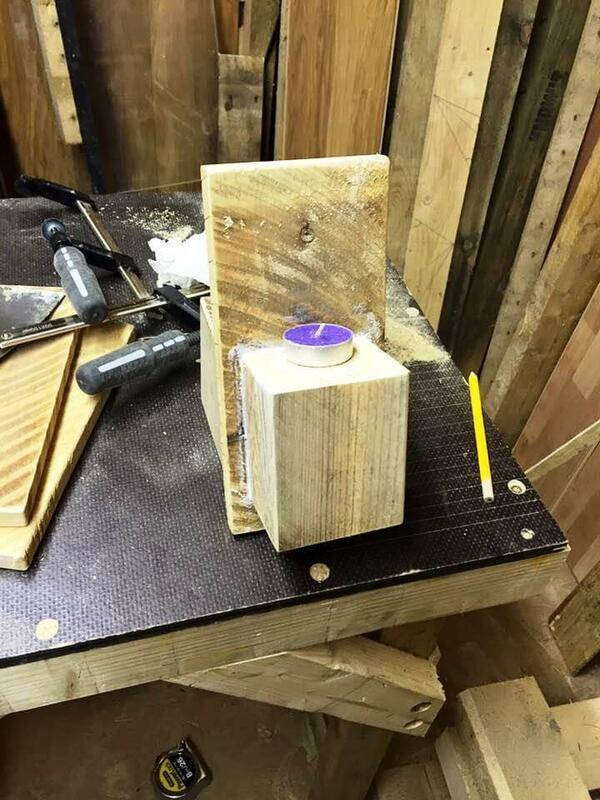 Mount the pallet chocks over the custom cut pallet slats using glue, and fix also the custom tea light over the pallet chocks! 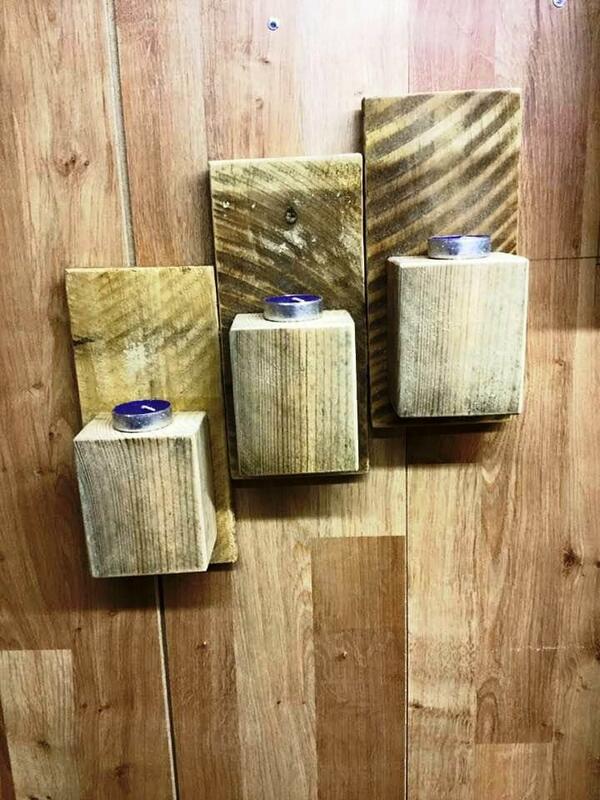 Build a set of such a candle holders and just install them to your favorite wall area in a patterned way, here 3 pallet candle holders have been mounted on the wall in a stepped style! 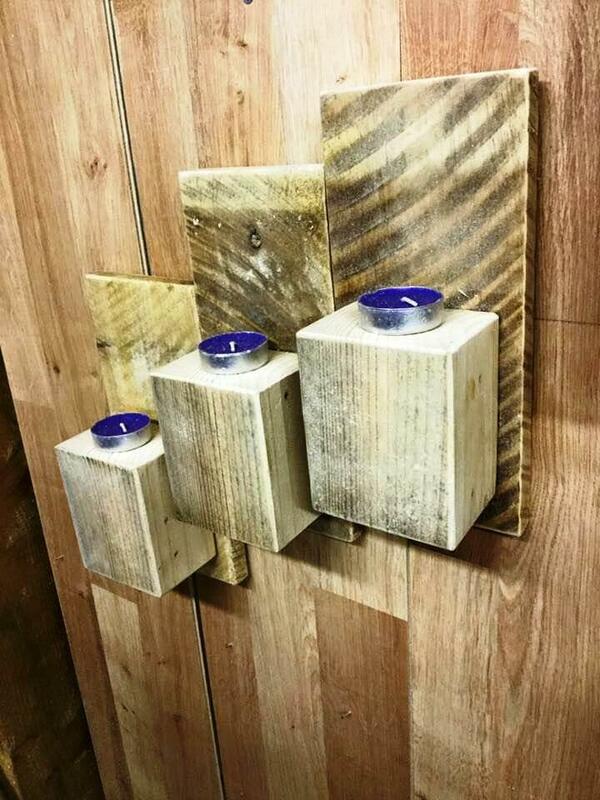 Soft glue from candle lights and rusticity of pallet wood will give a combined vintage impact to your decided wall area! Personalize these hanging candle holders by using paint and various metal accents, even the glitter and colorful papers! Before adding to wall area, you can also write some custom alphabets, name letters or quotes over the pallet chock! A low-cost but a fantastic way to jazz up your interior walls, do make a copy of these stylish wall hanging pallet candle holders!